Bridge demolition projects generally require Clean Water Act Section 404 permits and 401 certifications from the U.S. Army Corps of Engineers (COE) and the Department of Natural Resources respectively. In addition, a Section 9 permit from the U.S. Coast Guard (USCG) may be required to demolish a bridge in navigable waters. These permits are required for any impacts to stream and/or wetlands. Depending on the amount of impact, mitigation for impacts may be required. In general, Section 404 permits require quantification of impacts to wetlands and waters of the United States (streams primarily). The environmental specialist is responsible for plan reviews and submitting the impact analysis to the COE. These impacts are the basis for permitting. Nationwide Permit #14 (Linear Transportation Projects) can be used to authorize most smaller bridge demolition projects. However, a Nationwide Permit #33 (Temporary Construction, Access and Dewatering) may also apply to bridge demolition projects that do not result in any permanent impacts. In the most extreme cases, an individual permit will be needed to authorize those projects requiring more than 0.5 acre of permanent impact to wetlands and/or waters of the U.S. The individual permit process usually requires at least one year to process. The nationwide permit process usually requires at least six months. Bridge demolitions on navigable waters and/or larger streams may require individual permits and Section 9 permits from the USCG. These larger demolition projects usually require extensive interagency coordination, including U.S. Fish and Wildlife Service compliance for threatened and endangered (T&E) species. Floodplain development permit considerations are usually required within regulatory floodways. All of these issues must be satisfied to complete the Section 404 permit. Some nationwide permits will require mitigation, and almost all individual permits will require mitigation. NOTE: Demolition activities are normally not included as a part of the Section 404 CWA permit authorization for construction of bridges on navigable waters. 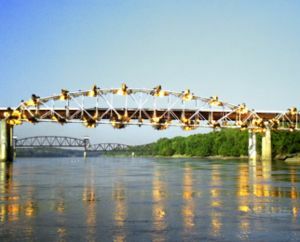 MoDOT’s Bridge Division submits a separate permit application to the USCG before letting of the bridge demolition contract. At the initial project screening stage, the environmental specialist screens the general area of the project for obvious constraints such as wetlands. The district initiates this process by submitting an RES to the design division. Any findings pertinent to the project will be relayed to the district in the RES response. At the location/conceptual plan stage, the impacts are further assessed in a more detailed manner. The environmental specialist will work with the design team to determine the Section 404-related components (i.e., staging areas, causeways, temporary crossings, etc.) that will be needed to complete the job. At the right-of-way plan stage, the exact impacts are calculated based on the right-of-way plans, which are also used for permitting purposes. The environmental specialist will apply for the permit at this time. This stage requires input from resident engineers and bridge personnel to ensure the proposed access options (i.e., causeway, staging areas, etc.) that may be required are adequate to complete the bridge demolition activities. The Section 404 permit and Section 401 certification, if needed, should be obtained prior to letting. The targeted date for obtaining the required permit and certification is the plans, specifications, and estimates (PS&E) date. Once the COE has issued a permit, the environmental specialist must approve any changes to the plans; any changes may also require modification of the Section 404 permit. Any proposed deviation in bridge demolition activities should be addressed in the Preconstruction Conference. If these changes would affect the 404 permit, then the environmental specialist will consult with the COE to obtain the necessary clearance. Photographic documentation that removal of temporary access measures (i.e., work pads, causeways, etc.) has been completed may be required to demonstrate compliance. Contact the environmental specialist if change orders involve a change in the work within streams or wetlands. This page was last modified on 23 October 2015, at 07:26.